You do not need to spend a lot of money for homeschool art projects. I have used recycle household items and inexpensive materials from the store. Art history is usually expensive. I did find some ways to make it more affordable so that we could learn about the famous artists. Here are some of the art projects that I have done with my children though the years. Preschoolers need to develop their fine motor skills. Art projects can help. When my children were young l liked to use large crayons. It also meant that I needed to find pictures to color that did not have a lot of detail. I also had my preschoolers use the crayons to color over objects. We would find leaves or other objects that had interesting textures. Besides leaves we used coins and stencils. I would tape the object to the table and place a piece of white paper over the object. I would have my child use the side of the crayon to color over the object. Using scissors to cut out shapes also helps preschoolers develop fine motor control. You can have your child cut out pictures in magazines. Use the pictures to make collage. If you cover the collage with clear contact paper you can use them for place mats. We do a lot of crafts. When my children were preschoolers we made things out of recycled materials. We would use gelatin boxes and bottle caps to make trucks. We made Christmas ornaments out of egg cartons, chenille wire, and jingle bells. When my children were young we also had a lot of items that they could use to make things. Cotton balls became a Santa Claus' beard or sheep. Paper plates became masks. As my children grew they learned how to sew, crochet, and do other crafts. Today my daughters like to make greeting cards out of fancy paper. Older children can learn how more about coloring. Children can learn about how to shade with crayons. In one of the lessons we did my children were to use a crayon to outline a picture. They then pulled color from the outline to shade the picture. Elementary aged children can continue to make things out of play dough. They can also continue cutting and doing other paper crafts. 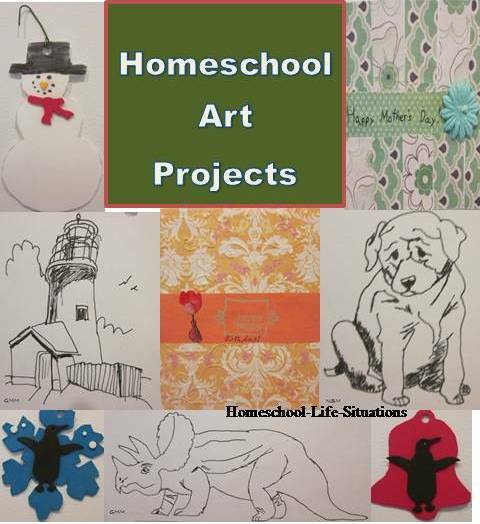 We did different homeschool art projects to help my children learn. One time we made a picture of ocean life. My children colored fish and plants and placed them on a large blue piece of paper. We then covered the picture with plastic wrap. Another time we placed star stickers on black paper in the shape of constellations. A project that I learned about when I was in college was to make props for a story. First read a story such as “The Three Little Pigs”. Have your child make three houses out of construction paper. Glue the houses on craft sticks. Make a house of straw by gluing shredded yellow paper on one of the house shapes. To make the house of sticks glue twigs on one of the shapes. For the house of bricks cut rectangles out of red craft foam. Have your child act out the story using the houses. There are craft kits for older elementary aged children. We have bought several kits that used craft foam. My children have made Christmas ornaments and door hangers using the product. We have also bought cross stitch kits. My oldest daughter made a small ornament for her first project. If you know how to sew, quilt, knit, or crochet you can start teaching your child know. Homeschool art projects can also include paint. We have used water paint and tempera. We did not do a lot of painting because our dining room was carpeted. Another idea is to do sculpturing. Soap sculpturing uses a wooden carving knife, a cuticle stick, and a toothbrush. You can make the carving knife by sanding an end of a large Popsicle stick to a point. I already mentioned that I used recycled household items for art and craft projects. I also went through my junk mail for free children’s stickers. When I finished a sewing or knitting project I would save the left over yarn and fabric. When I went to fabric stores I would look for ribbon and craft kits that were on sale. Crayons, markers, colored pencils and construction paper is usually on sale during back to school sales. I find stickers at the dollar stores. Your child can continue to do homeschool art projects into high school if he wants too. If your child is talented now would be the time to invest in more expensive art supplies. Buy a good quality drawing pencils and paints. Have your child look into woodworking, stain glass or jewelry making. Ask what your child would like to study and get art and craft books from the library. Art appreciation is expensive if you buy pictures and go to art museums. I have saved money by using the resources in the library. You can find books on different time periods. You can also find books about famous arts. I always preview the books before I check them out to see if there are any objectionable pictures. A cheap way of having some pictures of your own is to look for pictures, magazines and calendars in second-hand stores. Homeschool art projects do not need to cost a lot. You child can learn a lot by using inexpensive supplies.